Japan is an island nation blessed with distinct four seasons. Each season has many traditional and current events and customs which would attract foreigners’ interest. In “Four Seasons in Japan” some of them will be introduced according to the seasons. The fall in Japan is full of many amusing events from art displays to festivals at local shrines. Moreover it is the season of good appetite, as more colorful and tasty foodstuffs which enhance your appetite are sold at the store , namely shinmai (newly harvested rice), sanma(saury) , kuri(chestnut) and various kinds of “kinoko”(mushrooms) .Kinoko literally means “child of a tree”.The most popular ones are shiitake, maitake and shimeji. They can be cultivated and are available for a reasonable price throughout a year. 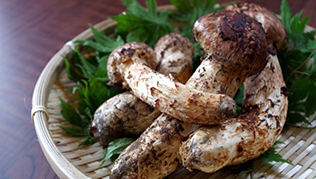 The most valuable mushroom is Matsutake, as it cannot be cultivated and is obtainable only in fall. It is considered a delicacy in fall and loved by the Japanese because of its flavor and taste. It is eaten grilled or cooked with rice (matsutake gohan). It can be found in forests made up of red pine trees in Japan. Its domestic production has been sharply reduced due to pine wood disease over the years, bringing the price up. Its supply largely depends on imports from foreign countries such as China, Korea and Canada.. The fall in Japan is the time for the regional fall festivals (matsuri). various kinds of things including foods and crafts. Mikoshi (a sacred portable shrine, where the spirit of a deity is believed to rest during the festival held in his honor) of various sizes can be seen carried on the shoulders of several bearers by means of long poles.